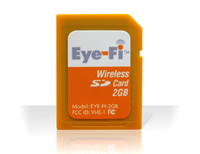 Eye-Fi , the company that makes the 2GB SD card with wireless access built-in, is one of the “it” companies of the moment, and they continue to build momentum in the market. Earlier this week, they announced that Nikon’s new D60 D-SLR would offer enhanced support for the Eye-Fi card (see Glenn Fleishman’s analysis of the news). And on Thursday, they introduced a Smart Boost feature that improves the card’s efficiency when transferring photos from your camera. The Eye-Fi has a few minor rough edges, and it will be a while before it can be used as a pro shooter’s tool—mostly because it doesn’t support wireless transfer of Raw images—but it’s an exciting concept that seems to have legs. When I was meeting with digital memory vendor Lexar today, they told me that they had licensed the technology from Eye-Fi, and would be offering 2GB SD cards this spring, with higher capacities to follow. Adding Lexar’s distribution might is a smart move, and the deal should help move the Eye-Fi’s technology further along, and ultimately, drive the price of the card down so that it becomes more of a mainstream product.